If you’ve taken cryptocoin mining beyond the hobby stages, you probably have at least one digital wallet on your system – possibly several. What happens if your OS were to crash? If you were to reinstall? Where would your accumulated cryptocurrency be? It is very important that you backup the private keys that secure your digital wallet so that you can restore them at a later time. Otherwise the keys required to claim ownership of your coins will be gone forever. It is also important that you backup your wallets regularly. It is not enough to backup your keys just once. See this entry on securing the bitcoind wallet for more details. 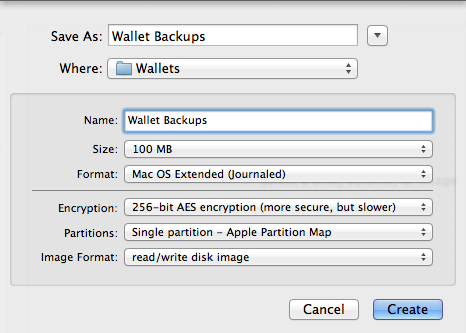 So what steps can you take on Mac OS X to keep your wallets backed up? Luckily OS X comes with several tools that help along the way. Additionally, the Unix foundation of OS X allows us to fall back on some time-tested solutions for this project. 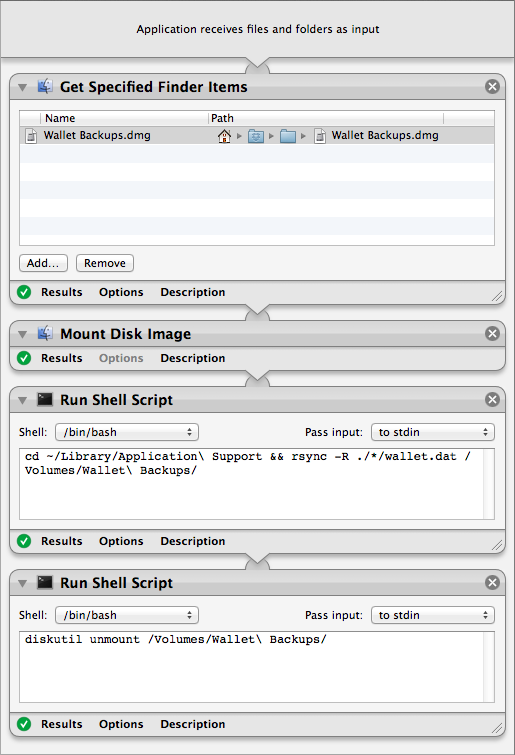 Step one will be to create an encrypted disk image used to store the wallet.dat backups. This is what Steve Gibson refers to as “Pre-Internet Encryption” – encrypting important data before backing it up to the Web. Now that we have a secure place to store wallet backups, the next step is to create a script that will do the grunt-work. Namely it should mount the encrypted disk image, backup any wallet.dat files (we could have Bitcoin, Litecoin, and who knows what other digital wallets – get them all), and then unmount the encrypted image. We can do all of this with Automator and a couple of shell scripts. Armed with encrypted storage and a backup script, the only thing left is to schedule the backup. The Unix foundation of OS X means we can do this by editing the system crontab, a configuration file that specifies the commands to run for cron, the Unix job scheduler. And we’re done. You can check your disk image each Sunday after midnight to ensure that your wallets have been backed up. You can also run the BackupWallets.app application to backup your wallets on-demand. This entry was posted in CryptoCurrency, Security, Technology on September 22, 2013 by Nathanial Woolls (Nate). Not sure what I am doing wrong. I’ve followed the steps to the “T”. 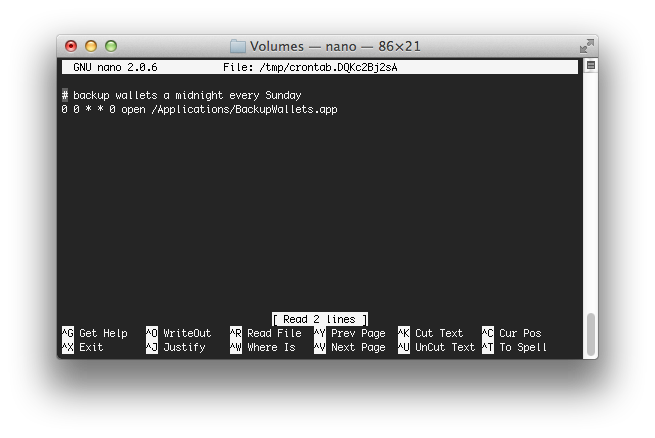 Does Cron still work in 10.9 ? Haven’t they changed the system to work with launchd ? Nate (if I may): First off – many thanks for your work on all of this. Your articles and blog entries have introed me to an entirely new world…for which I am probably ill-prepared. To wit: When I (think I) followed your instructions above to create a wallet backup action and attempt to run the new app, I get this message: The action “Run Shell Script” encountered an error. Check the action’s properties and try running the workflow again. I am no programmer (hence my being ‘ill-prepared’), so forgive my clumsy boldness. I just hope I am not the only one that might benefit from any insight you might offer.